Where to start. I interviewed Derek Kerswill and Matt LeBreton before I got a chance to write a review of the self-titled Downpour album. This has proven to be both good and bad. I want to give you my initial reaction to the album, because I had already listened to it multiple times before that interview. Unfortunately, it is proving to be impossible, because now I know so much more about what the album is all about. Fortunately, it gave it that much more depth. I was already thoroughly enjoying this album. I already felt it rock my core and soothe my soul, but now, it is a completely different experience. At this point, you are going to get much more than what you would have originally. Before that, let me tell you a little about the guys behind the musical curtain. 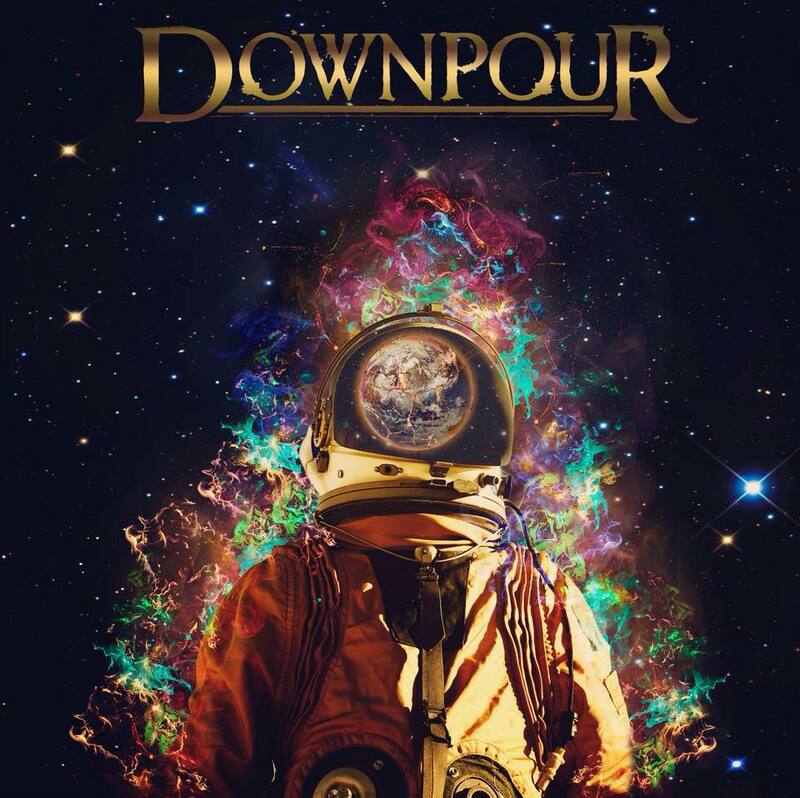 Downpour emerged from Worcester, Massachusetts and involves members; vocalist Brian Fair (ex-Shadows Fall), guitarist Matt LeBreton, bassist Pete Gelles, and drummer Derek Kerswill (ex-Seemless, Unearth). This is their debut album, which they were able to fund through a Pledge Music campaign with the help of fans. They were quickly picked up by label Noize in the Attic. LeBreton states getting this album out has been very difficult due to many roadblocks they hit. Thankfully, it all worked out in the end and we are able to experience this genius of an album. Let’s dig into the record. There are seven tracks, so I am going to talk about each one, here is your warning. If you have ever read any of my reviews, you know I write emotionally. I cannot help it, it is how my brain works, and music has always been a very emotional experience for me. With that said, this album is no different, and honestly, even more so than others. Derek has been a friend now for many years, so hearing what went on with he and his bandmates personal lives while writing this album really tugged at my heartstrings. They tagged the term, “Tuesday therapy sessions” for their band practice Tuesday nights. I will not go into what they were each struggling with, you can read my interview for their words on this, but I will say, you can clearly hear the turmoil and healing in the music and lyrics. This is what makes it a masterpiece of an album, among so many other reasons. Track one, “The Serpent’s Tongue”, kicks you in the teeth straight away. Heavy drum beats and pinch harmonics blast through your ears while Brian’s vocals wail at you, “Betrayal, is built on lies!” It has an Anthrax feel to me, in the best thrashy way, but moves into a heavier stance. I really dig the change in patterns, which makes headbangers confused, but leads the song on a more mysterious path. The galloping guitar and incredible musical combination make this song a perfect beginning to an epic album. “Truth in Suffering”, starts with more of a tribal drum beat. The guitar and bass work compliment it flawlessly. The vocals on this one begin less in your face, but that quickly changes, just to switch back again. I love when songs do this. The music that keeps me guessing what will happen next, really keeps me interested. The vocals still remind me of Bush-era Anthrax, but the music is much heavier and groovy, with less thrash. This is a beautiful song of, you guessed it, the truth in suffering. One thing I really think needs to be discussed is LeBreton’s solo work. He tears it up on this song, and rips your ears to shreds. He is a highly-talented guitarist. The next song, “Astral Projection”, was one of the first one’s they wrote. Well, LeBreton wrote it, then presented it to Kerswill who added his magic, and so on. This one starts with a more rock approach, which makes sense, since they started out writing rock before evolving to metal. The lyrics cut deep, and they are incredibly beautiful. You must pay attention, it is worth it. I felt I was projecting outward and looking in. So many emotions, I felt everything he was saying like it was my own experience. The fact that a song and lyrics can do that, is pretty damn amazing. Second, the flow and guitar work. This song does not stay rock, it moves to metal, and beautifully levels out to transcendence. “Still Waiting”, is a two-part song with track five, “Without the Fear”. “Still Waiting”, is a mantra Derek wrote while watching his grandfather pass to the other side. “We’re waiting for your last breath, so you’ll find peace in the light of death.” It is repeated throughout the song, in the most awe-inspiring way. I don’t know if it is because I know the story, or because I know Derek and we have had discussions of his fear of death, or if the song does exactly what it was written about, but I felt the atmosphere of being in a hospital environment while watching a loved one pass. The musical components create a stillness that is hard to explain. This crosses into “Without the Fear”, which is a song of healing. “There’s no more waiting……the peace within the light of death.” It is much heavier, and helps give you hope and understanding. “Without the fear of losing everything, would we every truly live our life?” Think about it. These lyrics are gold, and a philosophy we all should be living. I don’t know how much more I can say about these two songs, they are everything you need when dealing with loss of life, loss of hope, and the reminder that in the end, it is going to be okay. Track six is “Beautiful Nothing”. I love this song to the depths of my soul. It is a sojourn unto itself, outside of the journey this album already takes you on. It is heavy, musically dynamic, and has so many shifts. Throw in some pinch harmonics, incredible drumming, bass goodness, and, of course, lyrical wizardry, and this song quickly became my favorite with the first, second, third, etc. listen. LeBreton’s guitar work throughout this song is another jaw dropping edition to the album. Five minutes in, it slows down to where you think the song is over, then quickly jumps back into heavy, face melting, metal purity. “Mountain”, the album closer, has a completely different feel, but still plays out beautifully. The track is a reimagining of the original by Great Northern. To me, I felt like it went into a stoner rock type vibe. The tribal drum beats, the vocals, the voyage of the guitar and bass. I wish I could put into words what I feel when I hear this song. It is refreshing, after feeling like you went on an emotional roller coaster, and gives you a feeling of eternal peace. I felt like I was in Lord of the Rings when everything was gorgeous scenery and happy times. I had chills throughout the entire song. It is an epic ending to a highly emotionally driven album. I cannot speak highly enough about Downpour‘s eponymous debut. There are many changes throughout, great musicianship, incredible lyrics, and it takes you on a journey you didn’t realize you needed to go on. It is emotional, healing, and hopeful. Every metal fan needs to listen to this album.